DISCOUNTED GRIM REAPER STATUES - CLEARANCE ITEMS! We have discounted grim reaper statues with light balls, discounted grim reaper statues with skull, discounted grim reaper statues with lamps and more! 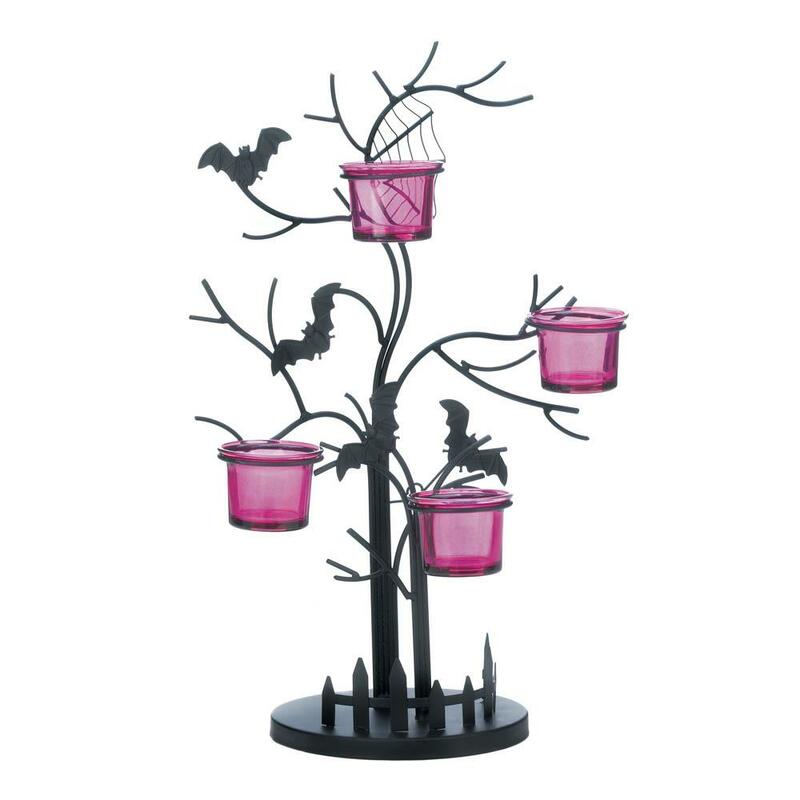 Create the spookiest spot in your home with this candle holder that features four glass candle cups perched in a black iron tree, complete with fence, cobwebs, and bats in flight. Great for Halloween! Candles not included. Creepy, crawly, and totally delightful! 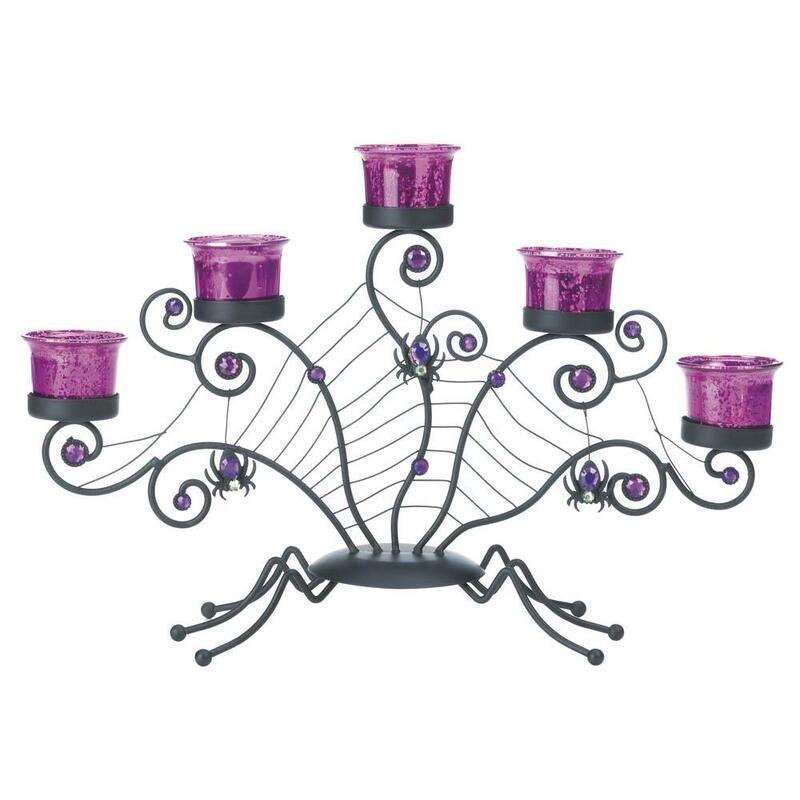 This spooky candelabra is made from black iron laced with spider webs and dangling spiders, and it holds five purple glass candle cups. Candles not included. The most delightful spiders you could invite inside your home for Halloween are right here! 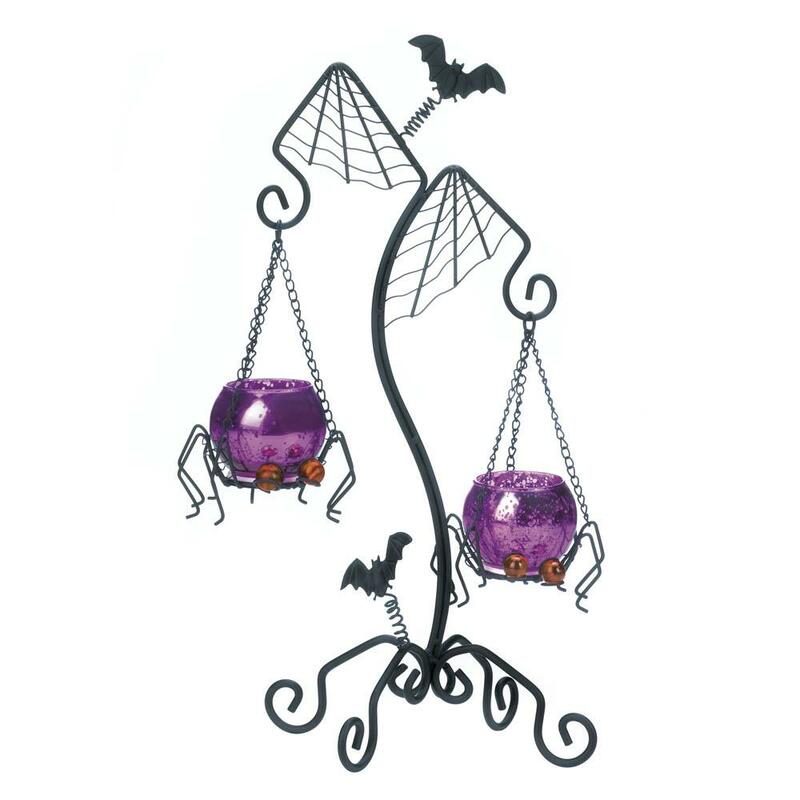 Two purple glass candle cups dangle in creepy crawly spider frames from a black iron stand that's decorated with webs and bats. Candles not included. Dimensions 10.5" x 5" x 16.2"
Ever get so lost in thought that you lose track of time? This statue can relate! 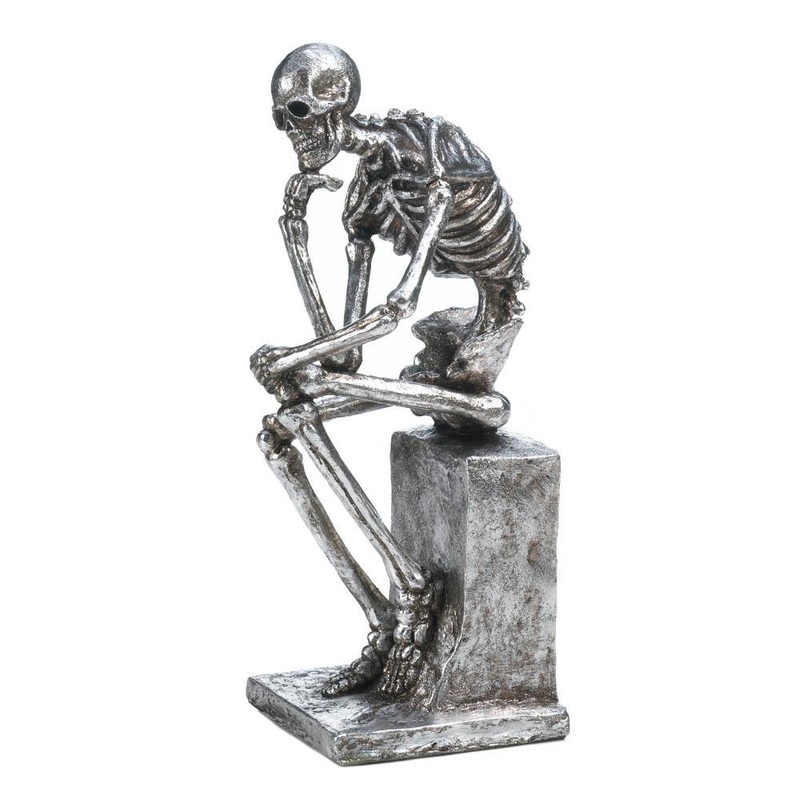 A whimsical take on the famous "The Thinker" statue, this silvery skeleton will add some fun to your room. 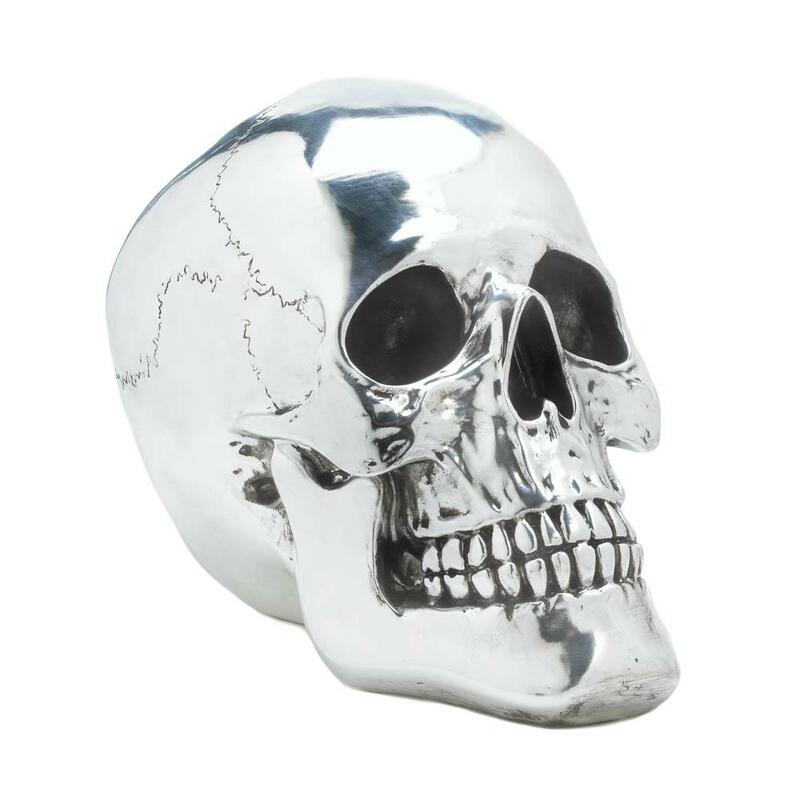 Whether you're celebrating Halloween or simply celebrating your unique decorating style, this fantastic smiling skull is the perfect way to add some personality to your room. This tabletop accent is made from polyresin and electroplated with a shining silvery finish. This skull duo can fit a whole bunch of books between them! 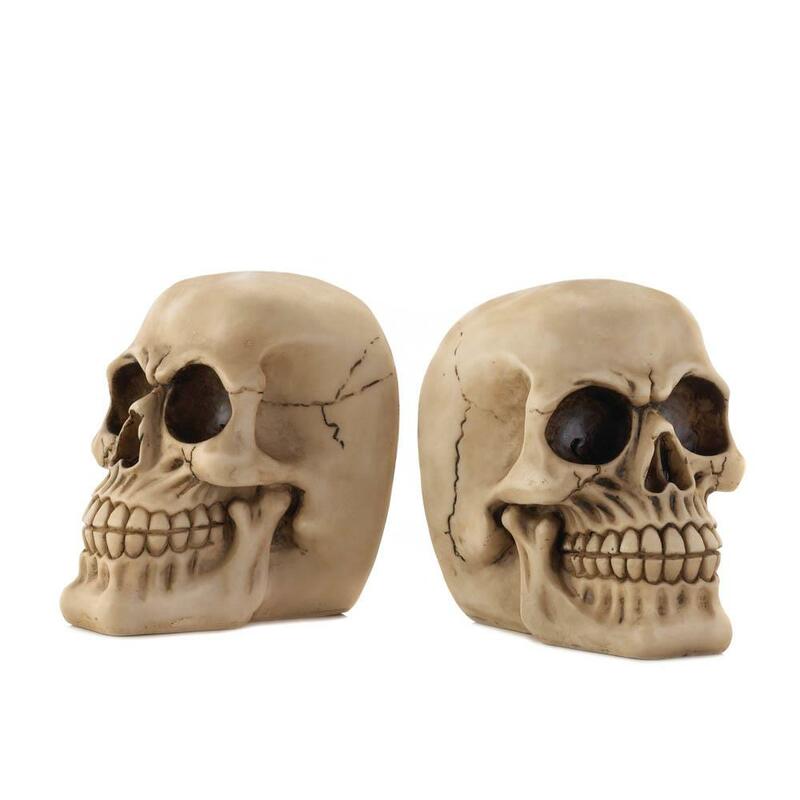 Made from polyresin, these detailed and whimsical skull figurines will smile while keeping your favorite stories neatly organized. Each is approximately 4" x 3 7/8" x 4 1/2" high. 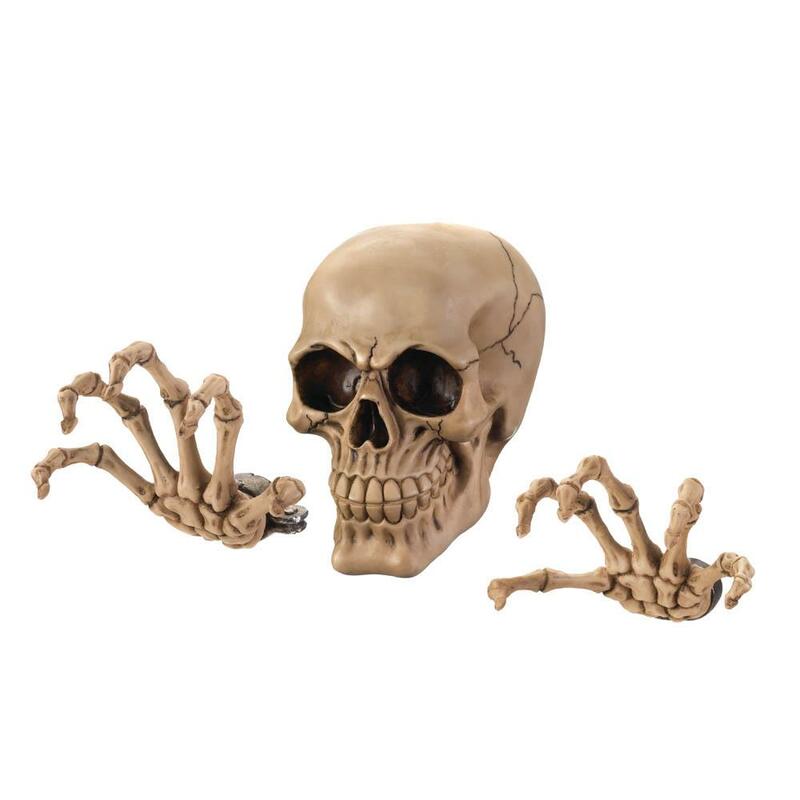 What has two bony hands and a spooky smile? This skeleton! You'll love this three-piece wall decor set made from polyresin that creates a cool 3-D effect when mounted on your wall. Skull: 3 7/8" x 3" x 5 3/4"; each hand is 4 1/2" x 4". Ghoulish glow and spooky style can be yours all year long with this cool polyresin figurine. 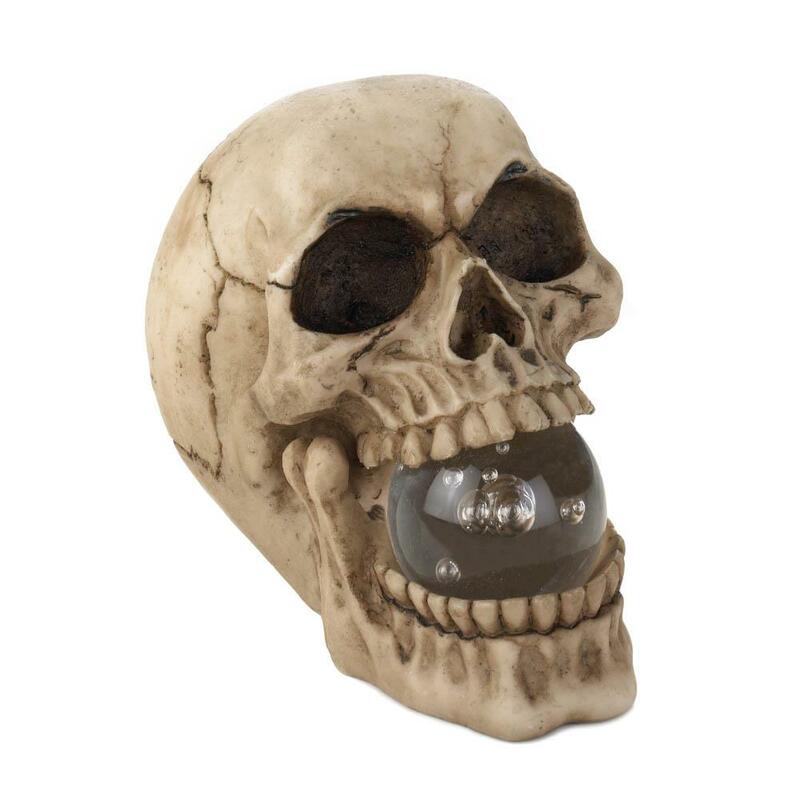 This detailed skull holds a glass orb in his mouth that lights up with help from an LED bulb and three little batteries. Great for your entry way or porch on Halloween! Three LR1130 button cell batteries included. See no evil, hear no evil, speak no evil! 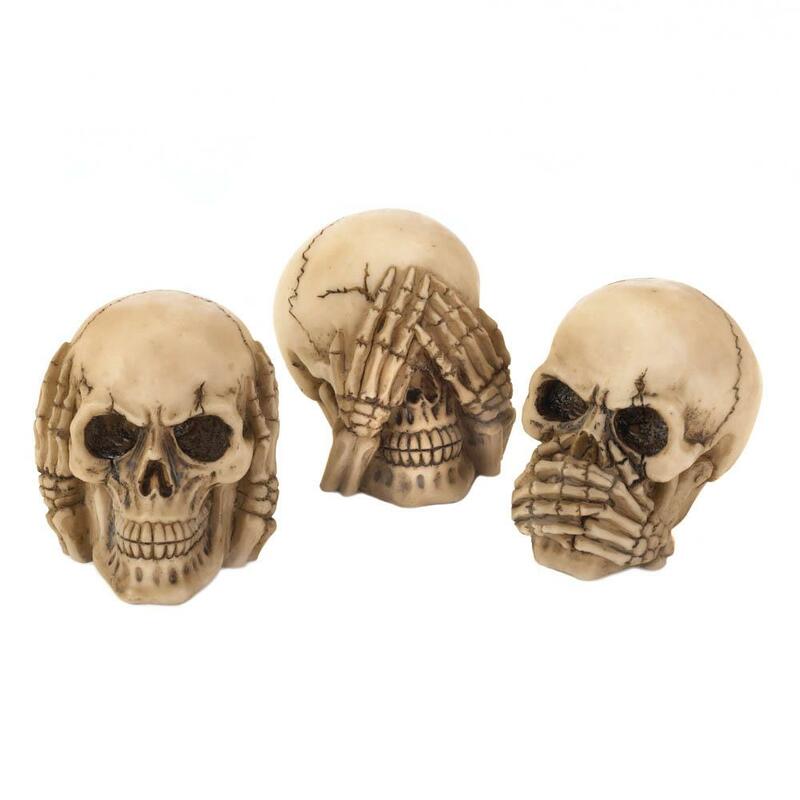 This trio of polyresin skull figurines puts a rock-n-roll spin on that classic adage. Great for Halloween or showcase your whimsical style all year long. 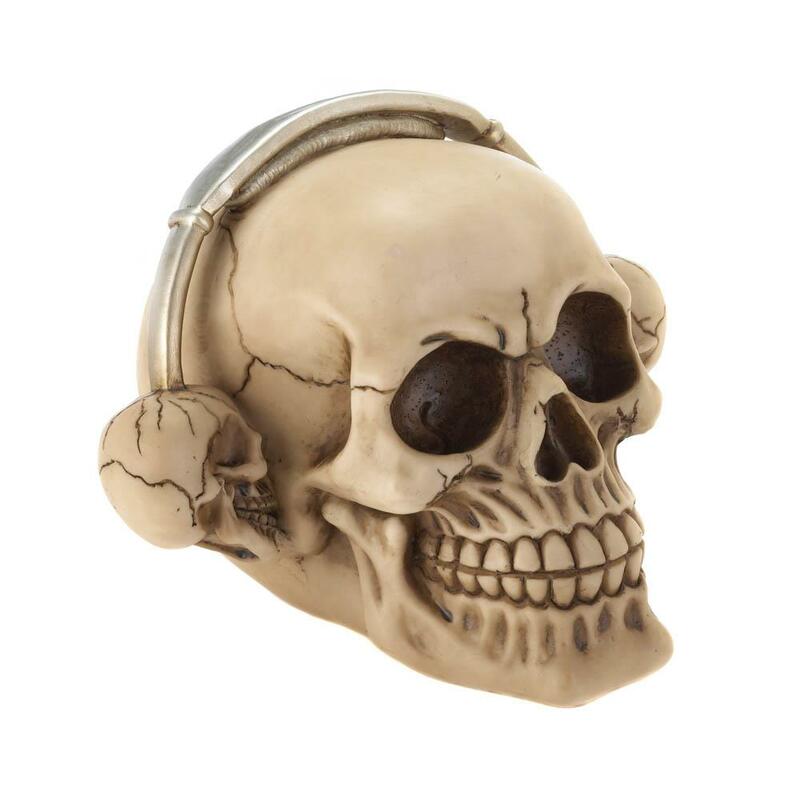 Turn up the cool factor in your room with this Rockin Headphone Skull Figurine. Made from polyresin, this grinning skull is wearing skull-shaped headphones and is ready to hang out on your desk, bookshelf or dresser. Great for Halloween or to show off your rock-n-roll style all year long. 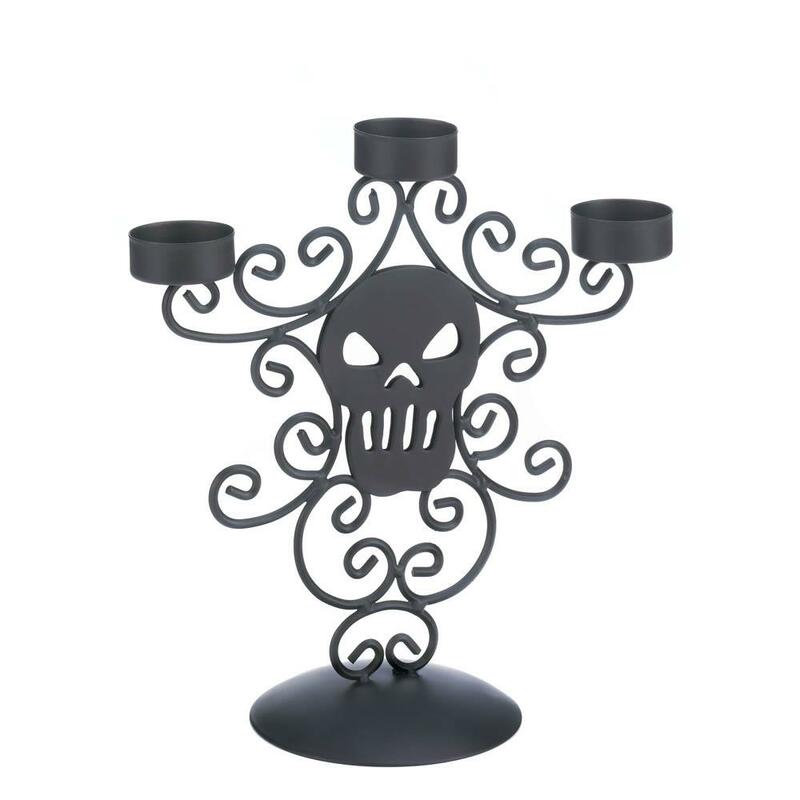 Dimensions 6.75" x 5.5" x 5.5"
Add a little fright to your night with this black iron candleholder. A skull ornament is surrounded by smoky black wisps that rise up to hold three candles of your choice. Its a spectacularly spooky way to illuminate your space. Candles not included. How many skeleton hands does it take to hold up a candle? Three! This eerie holder features detailed polyresin skeletal hands and a black metal base that's ready for your favorite pillar or round candle. Candle not included. 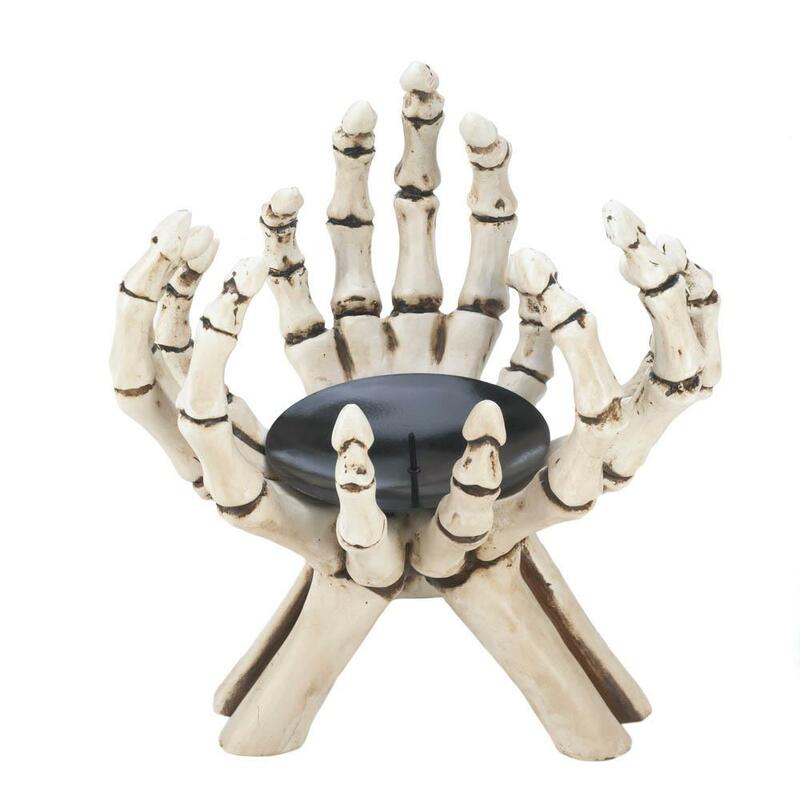 Give candlelight a creepy vibe with this whimsical stand. Two chain-shackled green witch hands with purple nails rise from your tabletop, holding a metal candle platform thats perfect for your favorite pillar or round candle. Candle not included. 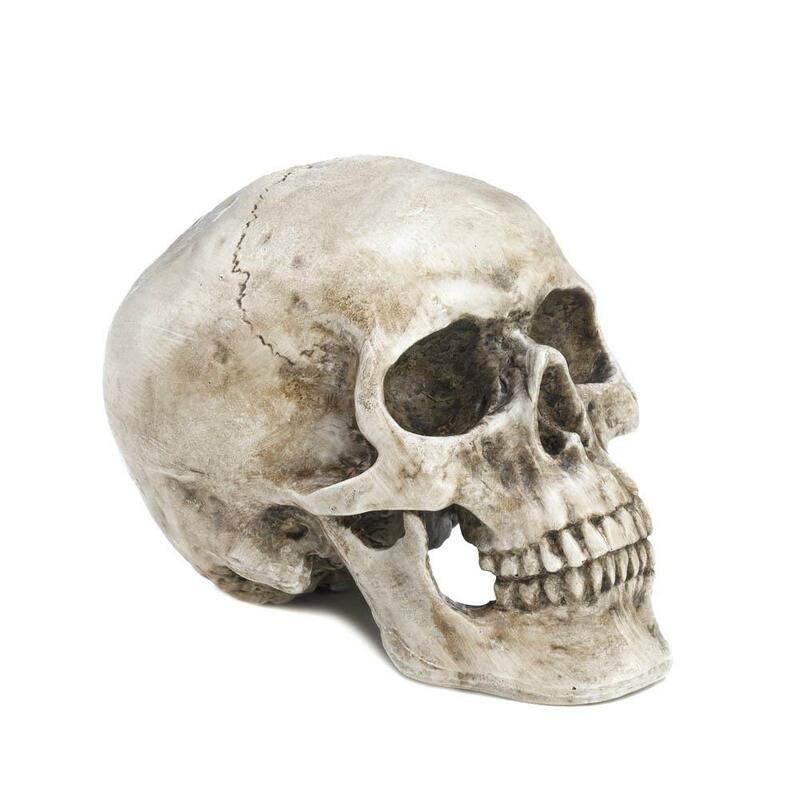 This skull decorative accent is so finely detailed that your guests will take a second look to see if its the real thing! A great way to decorate for Halloween or as an everyday eerie accent. Ghostly glow and scary style will light up your nights when you place a candle inside this eerie candle holder. 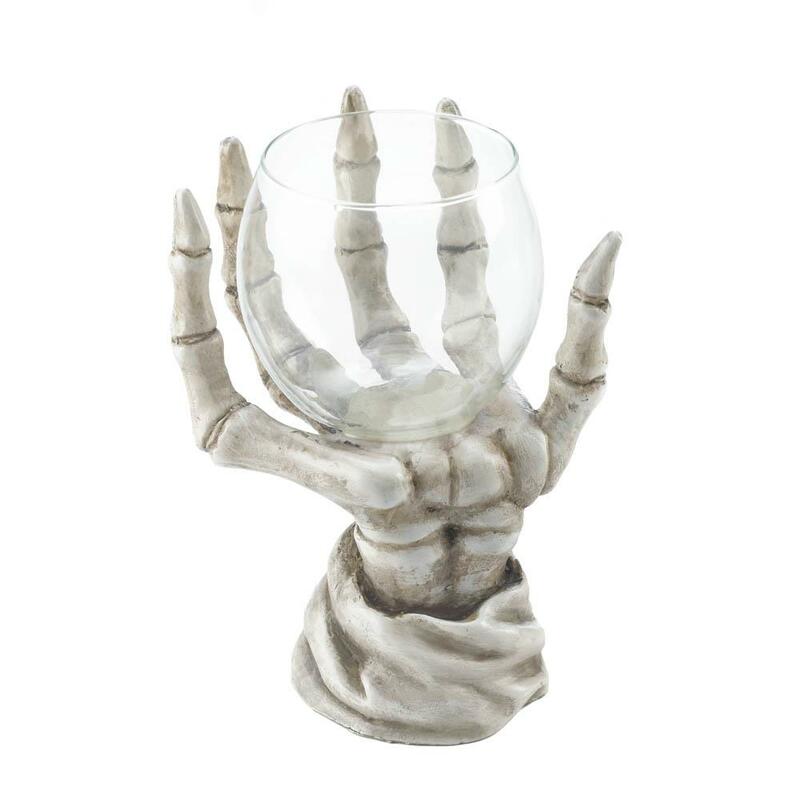 The detailed skeleton hand rises from your tabletop to hold the clear glass candle cup. Candle not included. 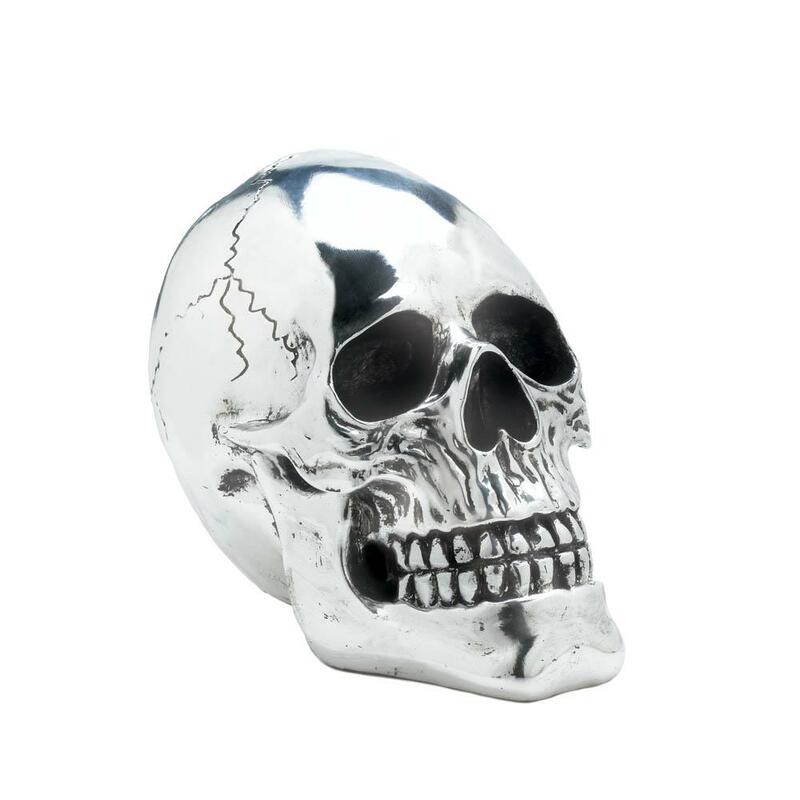 Dimensions 4" x 4" x 6"
This skull is a shining example of wild decor that goes beyond decorating for Halloween. The electroplated silver high-gloss finish really shines with high style, and the dark detailing makes it a fun addition to your room all year long. Dimensions 7.5" x 5" x 6.75"
10015871 - Here's a toast to enjoying a great bottle of wine no matter what! 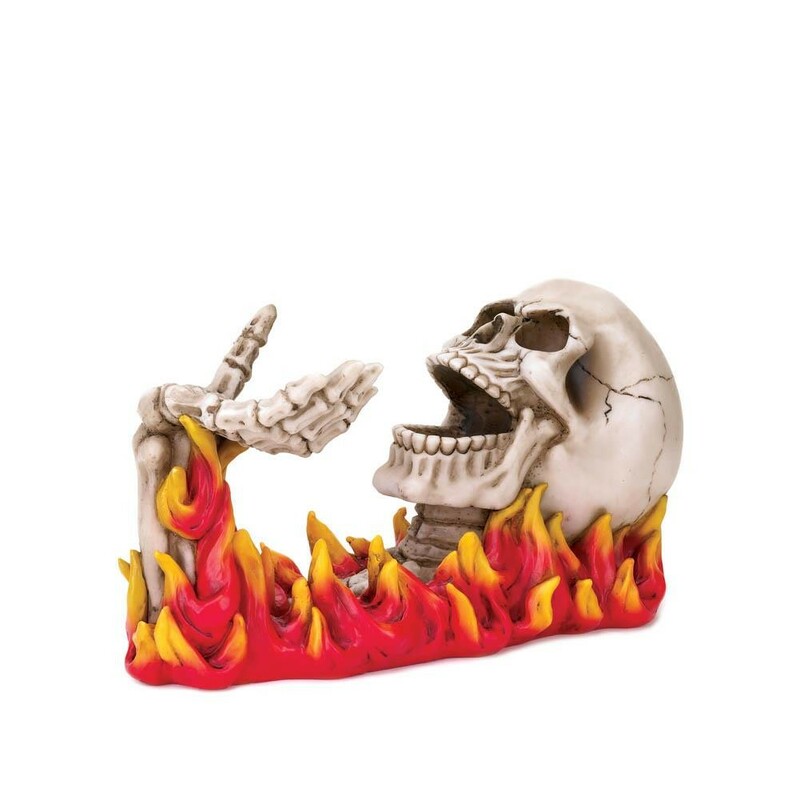 This fun wine bottle holder features a skeleton rising up from the flames to take a drink. Set it on your bar or counter and you've got an instant conversation starter with guests.